Despite Matias Duarte's hard work to duplicate the awesome multitasking found in webOS, Android 4.0 'Ice Cream Sandwich' still seems to come up short! To say that the card metaphor found in webOS nailed mobile multitasking would be a huge understatement. Some would argue that it perfected it. All webOS love set aside, many of you have loaded Android onto your TouchPad in order to enjoy the many creature comforts that Android has to offer - like Netflix and Draw Something. Don't worry, we aren't judging (much). However, you still find yourself yearning for some good ol’ fashioned webOS esque card swiping even when using Android. The gestures are a hard habit to break, and for good reason (being that they rock). To soothe your wanting fingers, there's WebCM9. WebCM9 is a neat little mod for a couple of TouchPad ROMs that changes the current task switcher found in Android 4.0 to a webOS-style task switcher. Yep, it's cards on Android. WebCM9 currently supports CM9 Official Nightly 2/28-3/09, 3/12-3/19, and 4/04-4/12; AOKP (Build 28, 29, and 31; and Milestone 4); and CM9 Alpha 2 ROMs (if you followed the instructions linked above, you've got CM9 Alpha 2 installed). WebCM9 isn't guaranteed to work on any other Android ROMs, and the developer doesn't recommend you try, unless you're willing to deal with the potential consequences. Installation is straightforward enough and is accomplished via Clockworkmod Recovery. Once installed you can further tweak out the settings of this mod with the Task Changer Pro app found in the Google Play Market. If you would like an in depth walkthrough on both WebCM9 and Task Changer Pro webOS Nation forum member ncinerate has done a very nice job of giving a step by step breakdown of the whole process that is bound to help even the most lost and confused of Android hacking hopefuls. So there you have it folks! You can have it both ways on your TouchPad. webOS cards in webOS, and webOS cards in Android. Sure, it's not the same as being able to run those apps in webOS, but it's better than nothing. 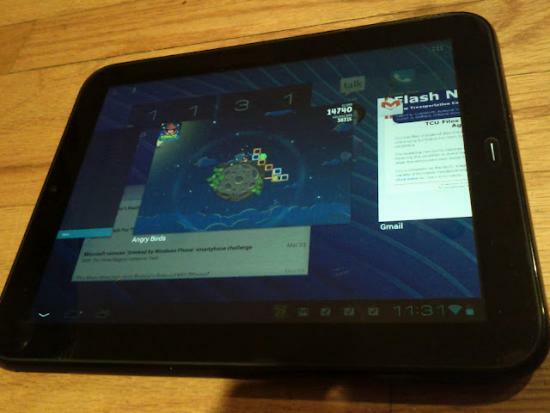 If anything, webCM9 makes using Android feel a little bit more like home to webOS users. And of course, our thanks go out to Dubi, Pacosal, Bboyairwreck, Brucekey, Tbob18, and everybody else who helped make webCM9 a reality.